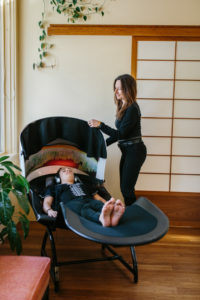 The NeuroSpa Energizing Station is the perfect solution for deep relaxation! This comfortable isolation booth is the perfect tool for deep relaxation (napping, energizing, resting booth). The NeuroSpa is used in most renowned spa centers because it helps achieve a real state of wellness by releasing tension at a deep level of the body. Positive effects are similar to osteopathy and full body massage therapy techniques. It is why many health professionals use Neurospa in combination with traditional treatments. NeuroSpa uses a patented worldwide technology developed in a laboratory in Quebec, Canada. NeuroSpa helps to achieve mental wellness, relieve pain, reduce stress, and induce a relaxation state using multi-frequency acoustic vibration. During a session you sit comfortably and select an energizing or a napping mode, then soft sensations captivate you from the first minute and gently stimulate your body. After a short time, the acoustic frequency neutralizes resistance and communicates directly with the nervous system which gradually replaces tension caused by stress. The comforting sensations fill your whole body, leaving you in a state of peaceful tranquility. It’s a revitalizing experience that helps you be centered in the moment and provide a continuous warm feeling during normal daily activity. The NeuroSpa allows you to achieve a temporary state of wellness and improves your body’s energy in a relatively short time (15-30 min). Regular sessions help provide permanent mental and physical balance.